The Nursery at Garden Gate Landscape & Design has been one of my favorite places to visit since the launch of Plant More Plants. Located on a large wooded lot in Montpelier, the nursery is a delightful place to shop for Virginia native plants. Owner Beth Farmer is a certified landscape designer and horticulturist. She’s been a partner with the campaign since the beginning. You can also find her native plants grown from seed at several local farmers markets. Now through Nov. 13, Beth is having a big fall plant sale. If you visit the nursery, you can save 15 percent on all plants. The nursery is open Fridays and located at 15101 Quaker Church Road, Montpelier. 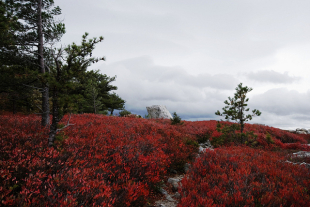 This entry was posted in Native Plants, Plant More Plants, Wildlife and tagged in fall, native plants, montpelier | Leave a comment. Resolve to shop at locally owned garden centers in 2015. Pictured is the Nursery at Garden Gate in Montpelier, Virginia. Attend a rain barrel workshop and build your own. A soil test is inexpensive and informative. Everybody's doing their best to form new habits and make new commitments to healthy behavior in the New Year. From diet and exercise to work and school, there’s no limit to the areas in which folks are trying to better their lives. To that point, your outdoor landscape is a good place to set a few resolutions, too. Check out these seven resolutions for a better sustainable landscape in 2015. Work with a sustainable landscape professional to help your yard look its best. If you plan to have any work done on your home’s landscape this year, consider using a landscaper that shares in support of the Eight Essential Principles of Conservation Landscaping. Following these principles ensures that all work is beneficial for the greater landscape of your area and sustainable for years to come. 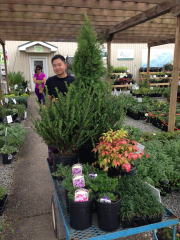 Shop at a locally owned garden center. Before the days of Lowes and Home Depot, locally owned garden centers were the go-to spots for landscaping supplies, plants, and more. Unfortunately, the advent of these big box retailers has really put the squeeze on the smaller competitors, businesses owned mostly by dedicated locals with a passion for gardening. Take the time to seek out a locally owned garden center when you’re ready to make your next outdoor/landscaping purchase. Your support goes right back into the local economy, and it’s a gesture that brings nothing but good things to your community. As cliché as it may seem, planting a tree is still a very noble resolution. For example, a wooded acre has the potential to produce enough oxygen for 18 people every year. Furthermore, just one hardy tree can help fight water runoff and erosion all by itself. And it doesn’t hurt that trees boost property values significantly. Build and install a rain barrel. Drought, drainage and water use are all important issues during every season of the year. During the summer, excess use through watering plants and lawns can cause conservation issues, and during other seasons improper drainage can cause severe runoff problems. One easy way to do your part and combat these problems is to build and install a simple rain barrel on the side of your home. The construction of a rain barrel is quite simple, and the conserved water from just one can dramatically reduce your water use while also decreasing harmful runoff. Replace at least one non-native plant with a native species. Invasive, non-native species can cause real problems for the local ecosystem. One great way to counteract the negative effects of invasive import species is to replace at least one non-native plant in your yard with a sustainable native alternative. It will not only enrich your neighborhood environment, but also sow the seeds for long-term environmental health! Soil acidity and nutrient levels vary greatly from location to location, as well as from year to year. This is why it’s important to periodically have your soil tested to ensure that it’s providing a hospitable substrate for your plants, shrubs, and trees. Get in touch with your local soil testing facility and have a sample from your yard evaluate. Your plants will thank you! Take the Plant More Plants pledge. Finally, take a look at the Plant More Plants pledge and use it as a guide for the next year’s worth of gardening, landscaping, and outdoor planting. The pledge serves as a comprehensive list of ways that you can improve your local landscape and ecosystem while cultivating sustainable habits for generations to come. Do you have any resolutions you’d like to share? Give us a shout on Facebook or Twitter to let us know! This entry was posted in Plant More Plants, Tips and tagged in andrew cutright, greensward | Leave a comment. 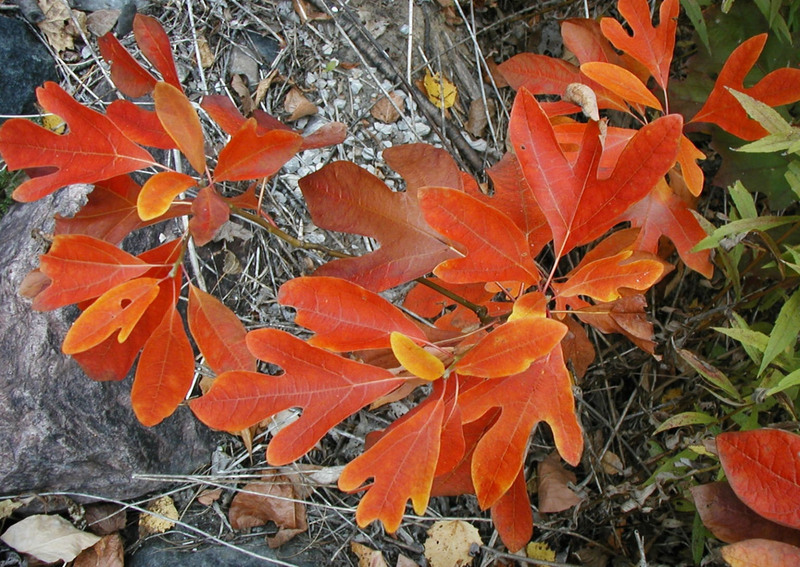 When we think of fall foliage, there are two plants that always come to mind: The burning bush (Eyonymous alatus compactus) and Bradford pear. Unfortunately, these once-venerated plants, although beautiful, are now becoming a problem in our native woodlands. They both have a bad tendency to naturalize, taking over large territories and choking out native species. There are a few native plants, however, that can put on just as good of a show and support a sustainable landscape at the same time. Staghorn sumac (Rhus typhina) typically grows as a shrub or small tree - multi-stemmed, forming a cluster. It has a very coarse stem, and it is best used toward the back of a perennial border - ideally with a number of shorter plants in front of it. 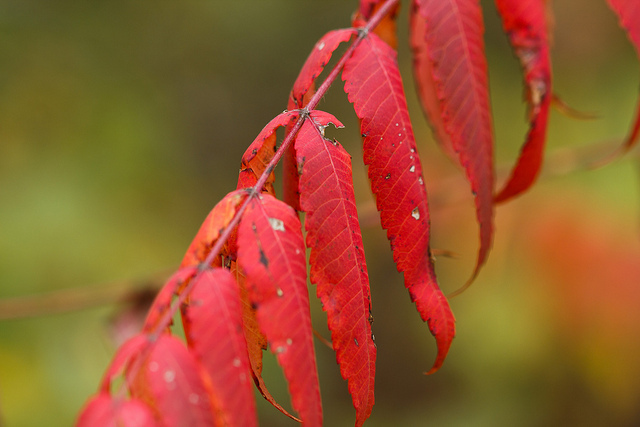 But no matter how you plant it, Staghorn sumac is always sure to please in the fall with its deep reds and burnt oranges. And when the bright foliage is gone, it produces striking fruit stalks that can be enjoyed through the winter. Several native species of viburnum are also fantastic choices for fall foliage lovers. One I'll mention here is the possum haw viburnum (Viburnum nudum 'Winterthur'). It has great fall color and, as a bonus, produces fabulous white flowers in the summer. Plus, both species have beautiful berries that will persist - especially the double file viburnum - into the early winter. Either species will be suited perfectly for use in hedges or as an anchor plant in your borders. Blueberry, native in Virginia as Vaccineum angustifolium or lowbush blueberry, is beginning to get some of the credit and recognition it deserves as an ornamental plant, rather than a simple agricultural crop. Blueberry bushes have gorgeous flowers that maintain a dense, uniform, and compact shape, they take to shearing and pruning quite well, and, last but not least, they have outstanding fall color. Even just a few blueberry bushes will add a beautiful display of rosy crimson to your home landscape. As a side note, there are a number of improved varieties, such as Brunswick, that fit into the Virginian climate and landscape just as well as our native species. Let's talk about a few native trees. The black gum tree (Nyssa sylvatica.) 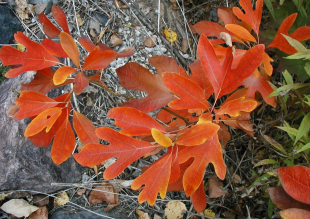 is a native species with excellent fall color, and it has historically been underused in the landscape. They have a very uniform shape and can grow as large as a maple or oak. They do have a habit of producing a small fruit that can be a little messy, so it's best to plant them away from patios or other trafficked areas. The upside is that the fruit is adored by birds. 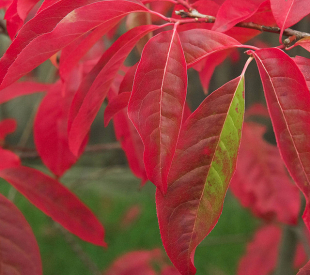 The sourwood tree (Oxydendrum arboreum) is another small native that produces brilliant fall colors. Aside from its beauty in autumn, the sourwood is also famous for the monofloral honey made using its blossoms. While the trees typically have an irregular form, their fall color is outstanding. They are a great small tree for backyard planting and can be used in much the same manner as a flowering dogwood. Take some time to plant these species in your home landscape and you’ll have beautiful fall foliage from native species for years to come! 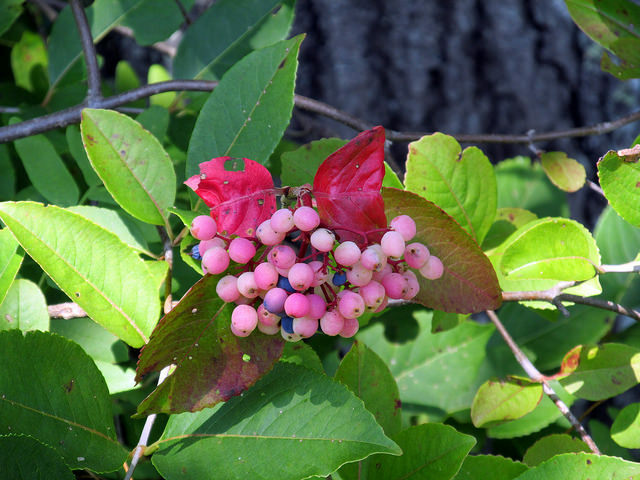 This entry was posted in Native Plants and tagged in andrew cutright, greensward, staghorn sumac, sourwood tree, fall is for planting, virginia native plants, lowbush blueberry, possum haw viburnum, black gum tree | Leave a comment. Enjoy some fall photos from Glen Allen Nursery and Garden Center in Henrico County, Virginia. This garden center is one more than 40 retail partners in the Plant More Plants campaign, as well as a member of the Central Virginia Nursery and Landscape Association. Photos taken Saturday, Oct. 4, 2014. 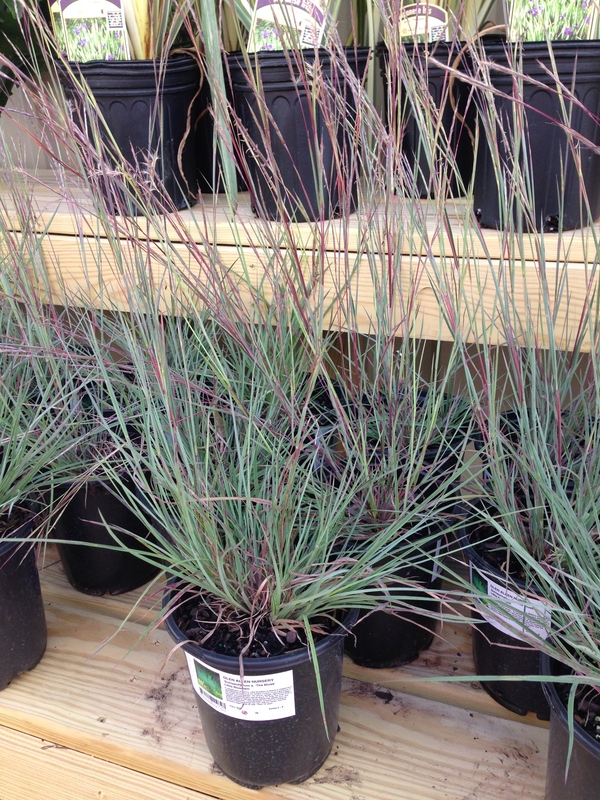 Little Bluestem (Schizachyrium scoparium), aptly named 'The Blues.' A Virginia native grass. Always good to see retailers promoting benefits of native plants. A sea of green, ready to plant. Trees await their new homes. This entry was posted in Plant More Plants and tagged in glen allen nursery and garden center, fall is for planting, october, henrico county | Leave a comment. Composting bins can be purchased or you can build your own. A pile in the backyard does the trick, too. Photo by Doro002 via Wikimedia Commons. We’ve been composting at my house for close to two years. One corner of the kitchen is reserved for old coffee cans where food scraps await their trip to the backyard compost bin. Grass clippings and fallen leaves go in there, too. For months, we kept piling on the detritus, not really sure what was happening inside our bin. It got the occasional stir, and sometimes we’d see the growth of some unidentifiable plant sprouting its way to the surface. “We must be doing something right,” we thought. It wasn’t until I shoveled my way to the bottom of the compost bin that I learned exactly what had become of those potato peelings, carrot tops and onion skins from months before. At the bottom was a layer of dark, rich humus. Earthworms and other soil-burrowing creatures had made it their home. The smell reminded me of walking deep into an old forest. That's the smell of composting success. Now that temperatures are warm, I’m using this brown gold to improve our soil gradually, digging it into spots where clay dominates. I never expected to be so excited about decomposed kitchen scraps and yard waste! I’m proud to say we are doing something right. The Chesapeake Bay Program: "How to Construct a Compost Pile"
This entry was posted in Gardens, Soil and tagged in compost, soil, julie buchanan | Leave a comment. Heuchera americana growing in the wild. Photo by Irvine T. Wilson. 'Amethyst Mist' used in a landscape design by Michele Fletcher. Photo by Michele Fletcher Landscape Designs. I admit it: I’ve got a hankering for heuchera. There’s something about this member of the Saxifrage family that gives me joy. Maybe it’s the dainty flowers, the earth-toned foliage or the adorable cultivar names like ‘Purple Petticoat,’ ‘Southern Comfort,’ ‘Tiramisu’ and ‘Cinnabar Silver,’ to name a few. 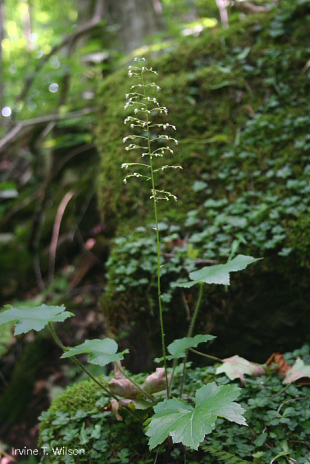 Heuchera americana, also known as alumroot, is a widespread native in North America. A close relative of tiarella, or foamflower, it grows wild in woodlands and rocky forests, often in crevices. The "Flora of Virginia" tells me eight species of heuchera are native to Virginia. Alumroot has a history of medicinal use, and the genus is even named for a medical botanist, Austrian-born Johann von Heucher. According to the "Flora of North America," the Cherokee took alumroot to cure dysentery and a variety of other ailments; the Chickasaw used the root as an astringent. Hybridization of our native heuchera skyrocketed in the last century. Today, we have hundreds of cultivars to choose from. Their foliage ranges from plum to chartreuse to variegated greens and silvers. Certified landscape designer Michele Fletcher says she loves the splash of color that heuchera adds to a garden. But there are a few things to keep in mind before planting. Most heucheras prefer shade or part shade, but some do well in full sun. Generally, the darker the foliage, the more sun it can tolerate. Well-drained soil is a must. 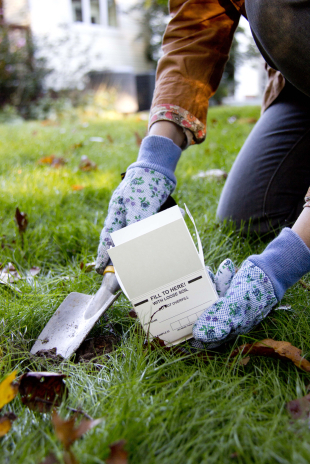 The plants can tolerate poor soil, but if you have heavy soil, dig in some compost or leaf litter before planting. Try heuchera as an alternative to hosta. 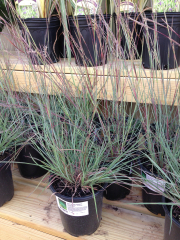 No matter which variety you choose, this plant will add soothing color and a playful, airy element to your landscape. Download a free landscape plan that uses Heuchera americana. For more about heuchera, read Kathy van Mullekom’s recent Daily Press article. Michele Fletcher is based in Rockbridge County, Va. For photos of her work and plant tips, visit her Facebook page. This entry was posted in Native Plants and tagged in heuchera, native plants, flora of virginia, michele fletcher landscape designs | Leave a comment. Ah, fall is almost upon us. Time to don light jackets and indulge in pumpkin-flavored goodies. Perhaps apple cider or an Oktoberfest beverage is calling your name. It won't be long before kids are deciding on Halloween costumes. But wait! There's something missing from this fall festival of fun. Fall is for Planting. Yes, when you think of plaid, the return of football and changing leaves, think of your yard as well. And I don't just mean that container of mums on the front porch. Fall is the best time to plant more plants, especially shrubs and trees. The soil is still warm and roots can establish themselves before summer heat comes back. To get you started, I've gathered a list of fall plant sales around the Chesapeake Bay region. Remember: More Plants. Less Runoff. Healthier Bay. And don't forget to visit local garden centers. They'll be open through October. Arlington's Long Branch Nature Center, 625 S. Carlin Springs Road, will sell a selection of plants and shrubs. Sale is cash only. Herring Run Nursery at 6131 Hillen Road, Baltimore, is open for retail sales 11 a.m. until 4 p.m. The nursery offers hundreds of species of native trees, shrubs and perennials. The ParkFairfax Native Plant Sale is scheduled 9 a.m. until 2 p.m., at 3601 Valley Drive, Alexandria. The sale is open to the public, and admission is free. Historic London Town and Gardens, a 23-acre park in Edgewater, Md., hosts its annual fall plant sale 10 a.m. until noon (members-only preview sale is 8 until 10 a.m.). Stay for a tour of the new trail system. More than 25 plant and craft vendors will be at the fall plant sale, 9 a.m. until 3 p.m., at Green Spring Gardens in Alexandria. Bring the whole family to Arborfest, 10 a.m. until 4:30 p.m., at Blandy Experimental Farm and State Arboretum of Virginia in bucolic Boyce. $10 per car. Shop plants propagated or divided from the grounds. Scarecrow-making and hayrides are on tap. Need I say more? The Lewis Ginter Botanical Garden in Henrico County hosts its annual fall plant sale. A wide selection of plants will be available from numerous small and local vendors. Admission to the sale is free. All plants are 20 percent off during the open house at Colesville Nursery, 14011 Nursery Road, Ashland. The open house is 8 a.m. until 4:30 p.m., but arrive early for the best selection. Select native perennials, shrubs and trees will be 50 percent off at The Nursery at Garden Gate's open house, 9 a.m. until 3 p.m. The nursery is at 15101 Quaker Church Road, Montpelier. The Virginia Living Museum, 542 Clyde Morris Blvd., Newport News, hosts its fall native-plant sale. Knowledgeable horticulture staff will be there to assist you. Admission to the sale is free. The Williamsburg Botanical Garden, located in Freedom Park, 5537 Centerville Road, Williamsburg, will offer fall perennials, butterfly-friendly plants and art for sale. This is by no means a comprehensive list. Please add events I left off in the comments section below. Happy fall planting! This entry was posted in Chesapeake Bay, Plant More Plants and tagged in fall is for planting, fall plant sales | 1 Comment. Spring is finally here, and our yards are beckoning us outside. Here?s a list of April events that are sure to get you in the planting mood. Everything will be 20 percent off at Colesville Nursery, 14011 Nursery Road, Ashland, Va. Lines get long at this annual sale, so arrive early and bring a plant wish list. Enter to win one of two Japanese maples. Children between the ages of 4 and 10 can sign up for the Sneed?s Seeds Club at Sneed?s Nursery and Garden Center, 8756 Huguenot Road, Richmond, Va. Club members get to make a monthly garden craft, receive a birthday gift and, most importantly, foster an early love for plants. 11 a.m. until 4 p.m.
Nearly 150 species of native plants will be for sale at Herring Run Nursery, 6131 Hillen Road, Baltimore, Md. Spend $30 or more and receive a free woodland poppy (redeem the poppy coupon at the nursery?s Facebook page). This nonprofit nursery is an affiliate of Blue Water Baltimore. Water your plants for free. Make a rain barrel at the Christopher Newport University Garden Symposium in Newport News. Contact Newport News Cooperative Extension at 757-591-4838 to register for one of two workshops. Cost is $50 per barrel. Rich Poulin of The Perennial Farm will give a primer on new and underused perennials at Countryside Gardens, 220 E. Mercury Blvd., Hampton, Va.
Natural Art Garden Center, 27358 Old Valley Pike, Toms Brook, Va., celebrates five years in business with an open house in conjunction with the Shenandoah County Gardens, Galleries and Grapes Tour. Make a day of it finding plants for the yard and sampling local ciders. Merrifield Garden Center founder Bob Warhurst (a.k.a., The Plant Whisperer) discusses how to be a successful gardener in a program at the Gainesville location, 6895 Wellington Road, Gainesville, Va. Self-proclaimed ?brown thumbs? should attend. The nursery of Garden Gate Landscape and Design, 15101 Quaker Church Road, Montpelier, Va., will be open for walk-in business. Owner Beth Farmer grows native plants from seed. The nursery is open two Fridays and two Sundays per month, but Beth?s plants also can be purchased Saturdays at the Lakeside Farmers Market and April 27 at Maymont?s Herbs Galore and More. Attend a free seminar about proper planting techniques for trees, shrubs and perennials at Boulevard Flower Gardens at Ruffin Mill, 2100 Ruffin Mill Road, South Chesterfield, Va. This is by no means an all-inclusive list. Add events we left off in the comments section below. This entry was posted in Plant More Plants and tagged in spring, events | 1 Comment. Shoppers browse the Lewis Ginter Botanical Garden's spring plant sale. Photo by Julie Buchanan/Va. Dept. of Conservation and Recreation. Some of us soon might be gazing wistfully at snow out our windows, but the truth is spring is not far away. What better way is there to beat the winter doldrums than to gear up for spring planting? To help get you started, we've compiled the following list of upcoming plant sales and giveaways. All events are in the Chesapeake Bay watershed, and many are put on by nonprofits, Master Gardeners or local soil and water conservation districts. Can't make it to one of these events? Browse the list of Plant More Plants retail partners. Most will be opening soon to fulfill all your spring planting needs. Remember: More Plants. Less Runoff. Healthier Bay. The Northern Virginia Soil and Water Conservation District is taking orders for its annual seedling sale through April 22 or until supplies run out. 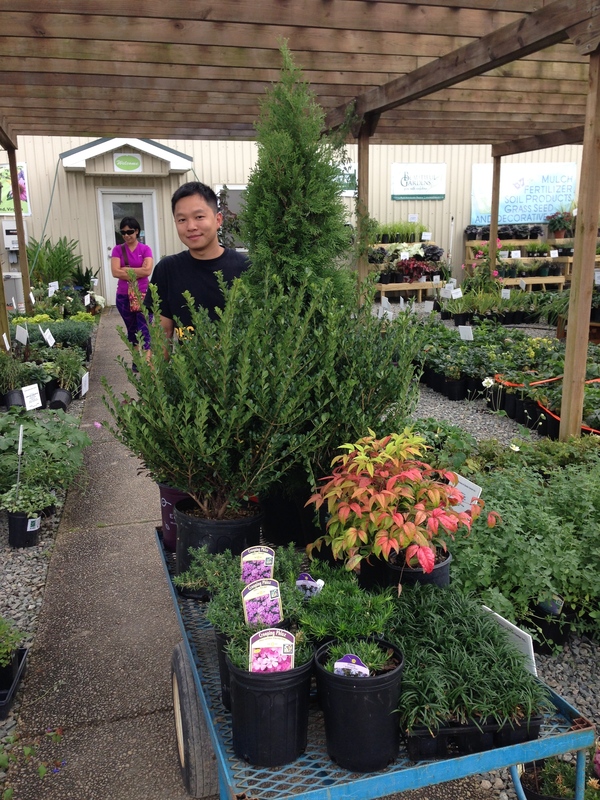 Shrub and small tree packages ($15.95) and tree packages ($10.95) are available. Visit the district's website to see which species are offered. Riparian landowners in Chesterfield County, Va., can make appointments to pick up free native tree seedlings March 22, 10 a.m. until 4 p.m., or March 23, 9 a.m. until 2 p.m. The goal is to improve riparian buffers throughout the county and filter stormwater runoff with native trees. The county?s environmental engineering department and the James River Soil and Water Conservation District are sponsors of the giveaway. To schedule an appointment, contact Lorne Field at fieldl[at]chesterfield.gov or 804-748-1920. The U.S. National Arboretum, 3501 New York Ave., Washington, will host a native-plant sale 9:30 a.m. until 2 p.m., in conjunction with the 27th Annual Lahr Native Plant Symposium. Henrico County, Va., residents can snag bareroot tree seedlings March 28, 2:30 until 6:30 p.m., at Dorey Park, or March 29, 8:30 a.m. until 1:30 p.m., at Hermitage High School. This giveaway is sponsored by the Henricopolis Soil and Water Conservation District. Seedlings were provided by the Virginia Department of Forestry. Herring Run Nursery at 6131 Hillen Road, Baltimore, Md., resumes retail sales 11 a.m. until 4 p.m. The nursery offers hundreds of species of native trees, shrubs and perennials. Check their website for detailed hours of operation. Trees, shrubs, ferns and wildflowers will be available for purchase 9 a.m. until 3 p.m., at the Arbor Day Trees and Native Plant Sale, sponsored by the Edith J. 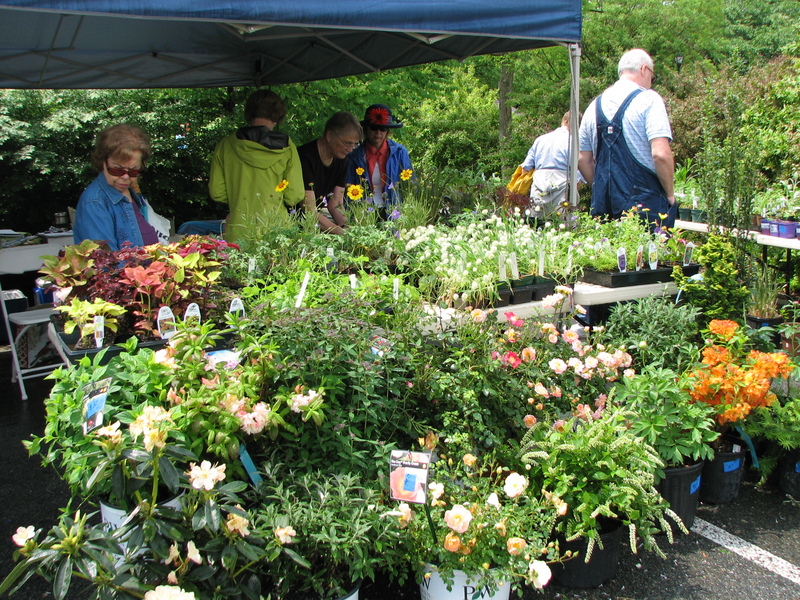 Carrier Arboretum at James Madison University, 780 University Blvd., Harrisonburg, Va.
Hanover Master Gardeners will hold their spring plant sale 9 a.m. until 2 p.m. in the parking lot of the Hanover County Social Services building, 12304 Washington Hwy., Ashland, Va. 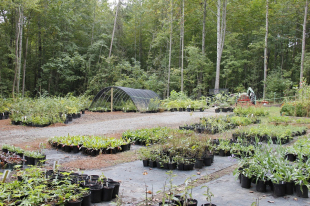 The Virginia Living Museum, 542 Clyde Morris Blvd., Newport News, hosts its spring native-plant sale April 20, 9 a.m. until 3 p.m., and April 21, noon until 3 p.m. Admission to the sale is free. 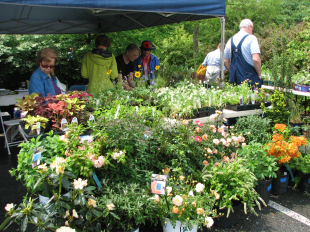 The ParkFairfax Native Plant Sale is scheduled 9 a.m. until 2 p.m., at 3601 Valley Drive, Alexandria, Va. The sale is open to the public, and admission is free. 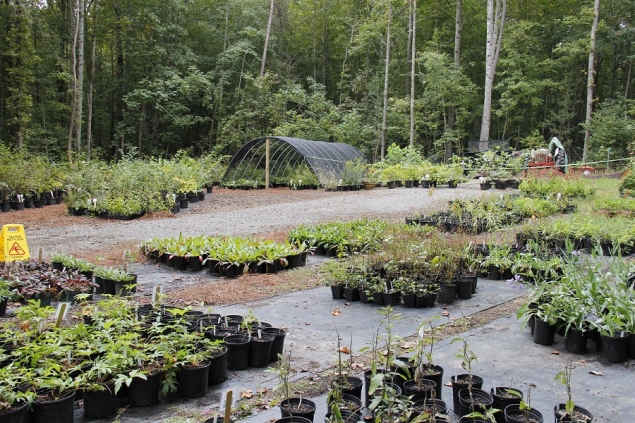 In case you missed the Virginia Living Museum's native-plant sale the previous weekend, swing by April 27, 9 a.m. until 3 p.m., or April 28, noon until 3 p.m. Admission to the sale is free. The Jefferson Chapter of the Virginia Native Plant Society hosts its plant sale 1 until 3 p.m., at the Ivy Creek Natural Area barn, 1780 Earleysville Road, Charlottesville, Va. The Lewis Ginter Botanical Garden in Henrico County, Va., hosts its three-day spring plant sale. A wide selection of plants will be available from numerous small and local vendors. See the website for sale hours. Admission to the sale is free. The Prince William Wildflower Society, a chapter of the Virginia Native Plant Society, hosts its native-plant sale 9 a.m. until noon at Bethel Evangelical Lutheran Church, 8712 Plantation Lane, Manassas, Va. The Virginia Beach Master Gardeners? spring plant sale is scheduled 9 a.m. until 1 p.m. at the Virginia Beach Farmers Market at the corner of Dam Neck and Princess Anne roads. The Master Gardeners of Prince William will sell plants 9 a.m. until noon at The Teaching Garden, 9535 Linton Hall Road, Bristow, Va. While you?re there, find out about the unique learning opportunities available at the garden. This is by no means a comprehensive list. Please add any events we left off in the comments section below. Happy planting! 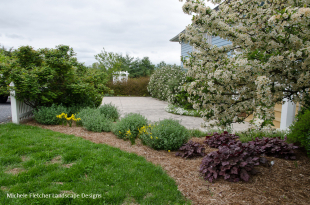 This entry was posted in Chesapeake Bay, Gardens, Native Plants, Plant More Plants and tagged in plant sales | Leave a comment. Help the bay with a Be the Bay T-Shirt. Photo from bethebay.com. Darling birdhouses at Merrifield Garden Center. Photo by Merrifield Garden Center. A special coffee roast, in honor of the James River. Photo from jamesriverassociation.org. Rain chains are prettier than downspouts. Photo from h2ocollect.com. 1) "Lynnhaven River, Restoring a Legend" - This new book by the folks at Lynnhaven River Now tells the story of the cherished river through photos and personal narratives. It's a coffee table book that surely won?t collect dust on the coffee table. Click here for purchase information. 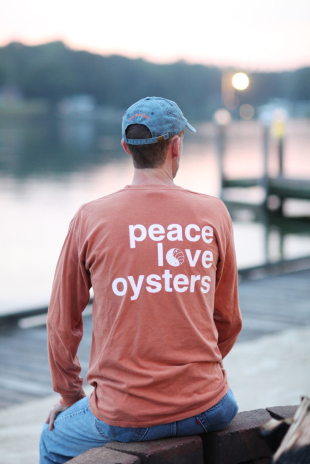 2) "Peace, Love & Oysters" T-Shirt - These sweet shirts by Be the Bay are perfect for river lovers. Plus, 10 percent of each purchase goes toward bay restoration projects. 3) Membership to a local botanical garden or nature center - Give your loved one year-round planting inspiration with unlimited access to botanical gardens and nature centers. Hint, hint: The Irvine Nature Center is offering a family membership for $32 on Living Social. Buy it before the deal ends tonight! 4) Gift cards to locally owned garden centers - Many of Plant More Plants? business partners are small and locally owned. We heard Colesville Nursery is giving 10 percent off gift card purchases this week. More Plants. Less Runoff. Healthier Bay. 5) Swanky birdhouses - Who says birds can't live in luxury, too? 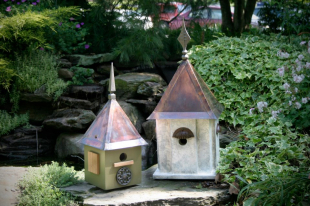 These sustainably made birdhouses should please feathered friends this winter. And you'll have the pleasure of watching them from afar. Merrifield Garden Centers are stocking the birdhouses. 6) "The Flora of Virginia" - The ultimate manual of Virginia plants is fresh from the publisher! It's an update to the only other flora Virginia's ever had, which was published a mere 250 years ago. Be sure to get a first-run copy while supplies last. 7) Annual membership to a local organization - The bay watershed is home to many organizations doing important work to keep our waters healthy. Consider the Potomac Riverkeeper, Blue Water Baltimore, Anacostia Watershed Society, Friends of the Rappahannock and Friends of the Lower Appomattox, to name just a few. 8) Composting supplies - Even in winter, you can begin building better soil and lessening the burden on landfills. Local city or county governments often sell composting bins to residents for a discount. For example, Arlington County sells Presto bins to residents at only $20 a pop. Make sure you have enough wrapping paper for these babies! 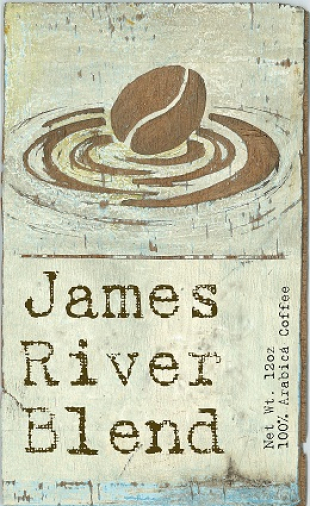 9) James River Blend Coffee - Great coffee starts with clean water. Blanchard?s, a small, family-owned roaster based in Richmond, has joined with the James River Association to create a special blend for America's founding river. A portion of the proceeds from each bag sold supports the JRA. 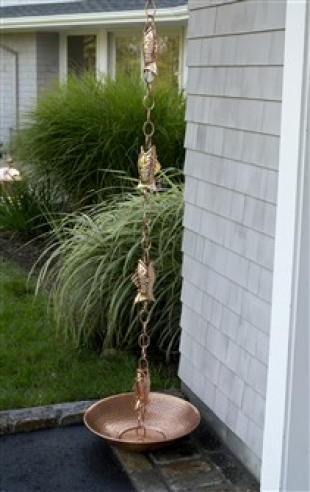 10) Rain barrels and rain chains - Our friend Kim Usry at H2O Collect reminds us these make wonderful gifts! Check out www.h2ocollect.com for cool rainwater-harvesting tools. This entry was posted in Chesapeake Bay, Gardens, Plant More Plants and tagged in gifts, plant lovers, colesville nursery, irvine nature center, james river association, h2o collect, lynnhaven river now, blanchard's, merrifield garden center, be the bay, flora of virginia | Leave a comment.